NO TO YESAA CHANGES – Little Salmon/Carmacks Chief Eric Fairclough and Grand Chief Ruth Massie of the Council of Yukon First Nations expressed their frustration with proposed changes to the territory's environmental regime to media yesterday. The press conference preceded an upcoming hearing by the federal standing committee on Aboriginal Affairs and Northern Development, scheduled for this Monday at the Gold Rush Inn. Yukon First Nations had some of their harshest words yet for proposed legislative changes to the territory’s environmental regime. 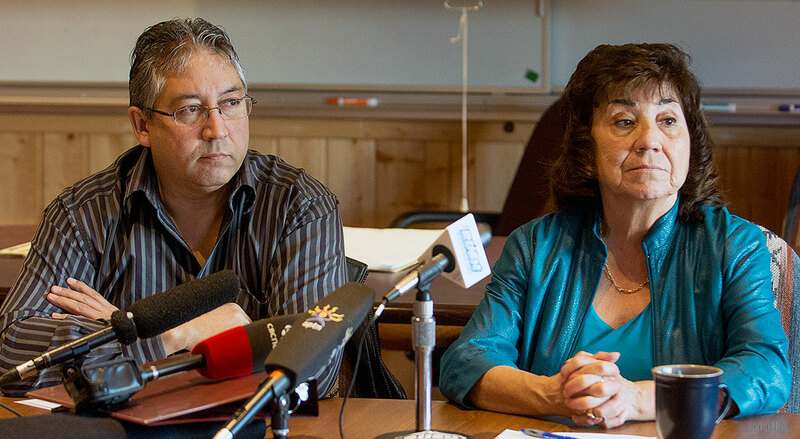 Ruth Massie, grand chief of the Council of Yukon First Nations (CYFN), and Little Salmon/Carmacks Chief Eric Fairclough said at a press conference Tuesday that amendments laid out in the federal Bill S-6 are “unilateral” and unconstitutional. The chiefs — two of the bill’s most vocal critics — renewed their vow to take legal action if the changes to the Yukon’s assessment laws go through. The press conference preceded an upcoming visit by the House standing committee on Aboriginal Affairs and Northern Development. The committee is currently deliberating S-6, which made it through the Senate last year and passed second reading in the House of Commons earlier this month. The hearing this coming Monday at the Gold Rush Inn will mark the first time a House committee has travelled since the federal NDP suspended it more than a year ago in response to a government bill. “These amendments are not consistent with the spirit and intent of our treaties,” Massie said. “To date, they give us no choice,” she replied to a Star question on recourse to the courts. “We spent over 40 years negotiating and implementing these agreements for a better future for everybody in this territory. The legislation in question was developed collaboratively by Yukon First Nations and the territorial and federal governments in 2003 in accordance with Chapter 12 of the Umbrella Final Agreement, which mandates a permanent, independent assessment process. The legislation — now on the verge of transformation — is protected under Section 35 of the federal Constitution Act. Massie criticized Yukon MP Ryan Leef’s absence during a vote on the bill March 11. Leef pointed to numerous steps he’s taken over the past year. “Any suggestion that I haven’t advanced their position or concerns is a complete abandonment of the facts,” he said in a phone interview today. Leef noted he has met with First Nations on S-6 several times, called publicly for the committee to travel north to hear from local “stakeholders,” made sure invitations were sent to each of the 14 First Nations and wrote directly to the prime minister. “I ensured unfettered access to the (Aboriginal Affairs) minister’s senior staff,” he said. The Star has obtained a copy of his letter to Prime Minister Stephen Harper, dated Dec. 12, 2014. Leef wrote that First Nations were concerned the amendments to the Yukon Environmental and Socio-economic Assessment Act (YESAA) would “undermine the neutrality” of the assessment process as well as the collaborative spirit of land claims agreements. The letter touched on each of the four clauses and echoed First Nations’ concerns on the changes. These provisions would allow a federal minister to impose policy direction on the assessment board, or delegate that authority to a territorial minister. They would also institute end-to-end assessment timelines and provide broad exemptions for project renewals or expansions that currently trigger an independent review. Fairclough expressed both optimism and skepticism at Tuesday’s press conference. “It’s been a long road. And we self-governing Yukon First Nations continue to believe that there is a solution to this issue. “The way things are progressing right now, even with the minister’s speech this morning, I really don’t believe that they’re going to make any of these changes at all,” he added of changes to S-6 suggested by the CYFN. Aboriginal Affairs Minister Bernard Valcourt addressed the standing committee Tuesday morning in Ottawa. “On each and every count where it is alleged that this violates the umbrella agreement — and I’ve met personally with the chief — she could not show me one single concrete example of how Bill S-6 violates the umbrella agreement,” he said. Fairclough disagreed, and lamented the “economic uncertainty” a lengthy legal battle might bring. “YESAA is not legislation that Canada may simply alter as it wishes,” he said, citing its constitutional grounding. In the House during question period today, Valcourt insisted the amendments are aimed at “fostering economic development by improving Yukon and Nunavut regulatory systems while protecting” the environment. The cabinet, which suggested two of the four amendments, did not respond to a request for comment before press time this afternoon. “It is not acceptable to have the Yukon and Canada steering the ship without Yukon First Nations at the helm. We are in this together,” Fairclough stated. At least six First Nations and the CYFN will speak at Monday’s full-day committee hearing at the Gold Rush Inn. They have been allotted seven minutes of speaking time each. Representatives from the Vuntut Gwitchin First Nation, Ta’an Kwach’an Council, and Teslin Tlingit Council, among others, have said they will participate. The premier will speak for 10 minutes. Members of the public are encouraged to attend the proceedings, though they will not be able to address the committee. Leef, who is not on the 10-member House Aboriginal Affairs committee, will sit in as a substitute during the hearing. A public forum will be held at the Kwanlin Dun Cultural Centre from 7 to 9 p.m. Thursday “so that those that attend have a place to be heard,” Fairclough said. Their concerns will be passed on to the standing committee, he added. Pretty easy to engage in "Lawfare" when you have 37 million people besides you... paying your legal bills. Lawfare is exactly what it is, and the grievance industry is THE new traditional life for the 21st century. Why the "public forum" in that building? Are there no others we can use?